Anthropologists Renato and Shelly Rosaldo lived in the Philippines with the Ilongot, an isolated tribe in the rain forest. They were based here, in a settlement of Kakidugen, from 1967 to 1969 and in 1974. 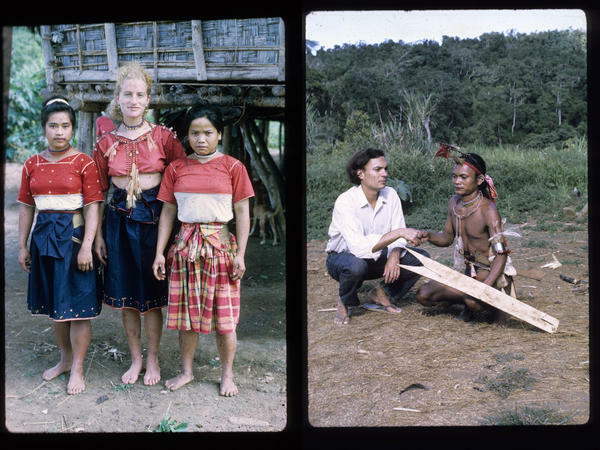 Renato took lots of photos while living in the rain forest, including one of Shelly with two Ilongot teenage girls. At right, Renato with Tukbaw, a close friend. 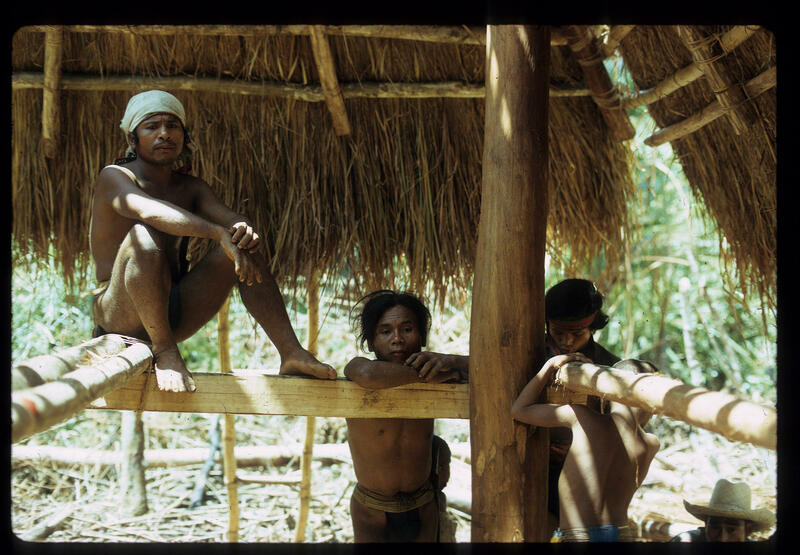 Ilongot men rest in the shade after building a house. Renato and Shelly lived in the home of the man on the left for a year. 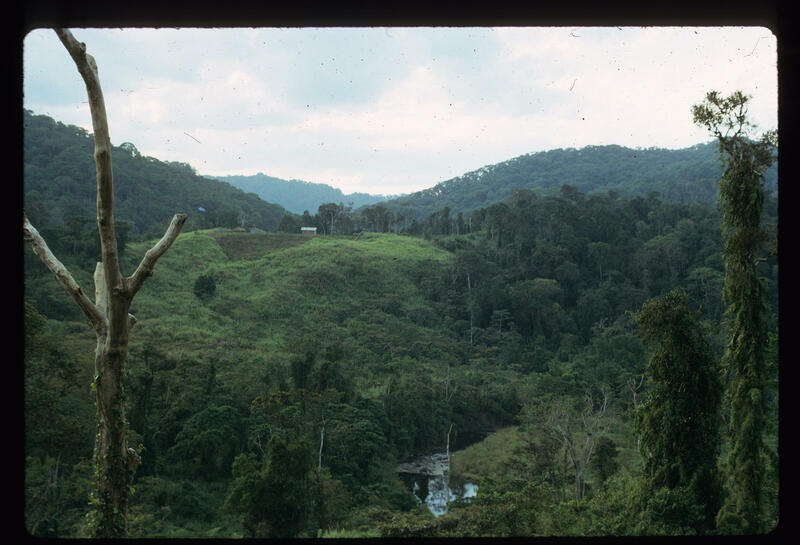 In 1967, anthropologists Renato Rosaldo and his wife, Shelly, went to live with the llongot, an isolated tribe that lived in the rain forest in the Philippines. It wasn't exactly an accident that this tribe was unstudied — it was known for beheading people. But Renato and Shelly were undeterred. As they immersed themselves in llongot culture, they began to learn the language. Simple words at first, then more nuanced ones that encompassed such things as love and anger. To Renato, all of the words were familiar except one. At first, he thought this word meant "energetic" or "productive." But then liget exploded out of that definition into an emotional landscape he had never before encountered. One evening, members of the tribe asked Renato if they could hear tape recordings of his conversations with the people he studied. The voice of a deeply loved and respected man who had recently died began to play. The room fell silent. The men's eyes narrowed and their lips curled, their faces turned into masks of rage. They told Renato that hearing the tape made their hearts feel liget. It makes us want to take a head, they told him, over and over. It makes us want to take a man's head and throw it. Renato didn't understand the world of chaos and violence that the llongot people connected to this word. Why did it drive men to kill? He tried to gain a deeper understanding, but defining liget was like trying to describe the color blue without ever seeing it. Fourteen years later, Renato and Shelly, along with their two young sons, went to live with the Ifugao, another tribe of the Philippine rain forest. While on a hike to a different village, Shelly fell off a 65-foot cliff to her death. That day, crouching next to Shelly's body on the riverbank, Renato felt the seed of an alien emotion he had never experienced begin to grow inside him. Back in America, after the funeral and the resettling into daily life, this feeling continued to grow. But Renato did not know how to express it, how to define it. And then one afternoon, as he was driving down a sunny street in Palo Alto, Calif., he couldn't bear it any longer. He pulled to the side of the road, and a howl came roaring out of him. The English words that best describe liget might be "high voltage": a powerful energy running through and out of the body. Renato had no control over when this feeling would come or how long it would stay. There was nothing within the American palette of emotions or in mainstream books about death that helped him. He just knew he had to howl. And because Renato could now grasp the force and meaning of the word liget, he was able to make some sense out of the chaos. He was able to give his emotions form, and let them pass through his body. Renato documented his journeys, both physical and emotional, through photographs and poetry. These poems are excerpted from his book The Day of Shelly's Death (copyright Duke University Press, 2013). And clear liquid splats into the wall. Shelly and Conchita hike toward a village upstream. I nap with our sons, one and five years old. A flock of songbirds abruptly silent. She fell into the river. I run, reach Shelly's body, drop to her side. A fly buzzes in, then out of her mouth. Her voice echoes from death. I rush to our sons. I put Sam on my shoulders, tell him his mom is dead. He wants to know when he will get a new one. An excerpt from How Do I, Renato, Know That Manny Knows? Down to the Magat Valley. Then up a winding mountain road. Manny grows giddy, giggling incessantly. In Baguio City I carry him into our apartment. He searches. Swivels. Nobody here. He bellows and shatters the enormous thick silence. A nurse pulls the gray sheet from Shelly's face. The doctor tells me to take the body to Solano to be embalmed. It is up to me, she says. I say, no. No, I will not leave my sons alone here. The Mayor of Lagawe shouts, How could you allow your wife to walk the trail alone? Why don't you embalm the body here in Lagawe? Father George says, Never mind the Mayor, he's drunk, then drives me and the boys to the convent in a VW bug. Where grief lives in public? His guard up, his feet heavy. NPR's Invisibilia is back for a third season. The show about the unseen forces that shape human behavior is taking a look at concepts like reality, identity, emotion and how those concepts shape our experience - sounds kind of abstract until you hear the stories and then you feel them. Today, Invisibilia co-host Alix Spiegel has the story of a man who was introduced to an emotional concept that does not exist in America and how he came to understand it. SPIEGEL: ...In a remote region of the Philippines a long time ago, 1967. 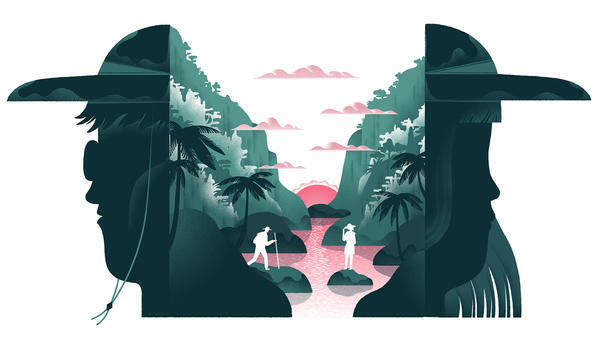 That was the year anthropologist Renato Rosaldo and his wife, Shelly, set off to live with the llongot, an isolated, unresearched tribe that lived deep in the rain forest. Now, it wasn't exactly an accident that the llongot were unstudied and isolated. ROSALDO: They're known for their headhunting. They'll kill somebody and cut off their head. SPIEGEL: But Renato and Shelly were undeterred. They knew that headhunting was part of a larger cultural ritual and felt certain that they wouldn't be at risk. So they packed up everything, including an enormous reel-to-reel tape recorder, and moved. And over time, they began one of the more difficult aspects of anthropological work - mapping the territory of the tribe's emotional world. ROSALDO: That's one of the difficulties with cultural translation. It doesn't map one to one onto our concepts. ROSALDO: They were familiar enough to me, yes. SPIEGEL: At first, liget looked like a simple feeling. And it had what we would think of as positive connotations. Renato would see a young man, and members of the tribe would tell him that man has liget. ROSALDO: He can chop down 10 trees from the forest today. SPIEGEL: But then one night, liget exploded out of that definition. It began innocently. Renato was sitting with some men, and someone asked him if he could play one of the tapes that he'd recorded. The voice of this man began to play. SPIEGEL: ...This man who had been revered and loved but who had recently died. ROSALDO: The room went suddenly silent, and I saw men's eyes all turned red. And they said turn off the tape. They couldn't stand it. And then they were talking about that this makes makes our hearts feel liget. SPIEGEL: This is what they told him. ROSALDO: They need to take a human head and throw it. I was just stunned. I said I've never heard this kind of feeling with this intensity in my life. SPIEGEL: What exactly was liget? It clearly wasn't just an excess of productive energy. Renato began asking everyone in the village, and from what he could piece together, liget was the communal feeling of being unmoored and out of control. Different things could bring it on - a death or painful reminder of it - but then the feeling would go viral, spreading to everyone in the tribe. One way they expressed the feeling was to gather together and wail. But the primary way that liget was relieved - at least in the tribe's history - was through the communal act of headhunting. SPIEGEL: Renato says he actually spent years gathering information on liget. But he says he never felt like he actually understood the concept in a real way. ROSALDO: We were out of our depth. SPIEGEL: Then came the fall of 1981 when Renato and his wife, Shelly, traveled to a different part of the Philippines. Their second day there, his wife, Shelly, set off with a guide named Conchita to explore. ROSALDO: ...To meet terrifying silence. The village suddenly became very quiet, and then, in walks the guide, Conchita. She said that Shelly had fallen. SPIEGEL: Conchita led Renato along the trail to the place where Shelly had fallen. ROSALDO: And they saw Shelly's body. The feeling I had was just almost a cosmic heaving, expanding and contracting, expanding and contracting, expanding and contracting. But it wasn't just me. It was everything around me. SPIEGEL: That day, crouching next to Shelly's body on the riverbank, he says the seed of an alien emotion he'd never experienced before began to grow inside him. SPIEGEL: It was muted at first, didn't fully express itself until after, after Renato had flown back to America and arranged the funeral. Then one sunny, California afternoon, when he was driving down a highway in Palo Alto, he couldn't bear the pressure. So he pulled over on the side of the road and this sound came roaring out of him. ROSALDO: I, out of nowhere, just started howling (vocalizing). SPIEGEL: He felt this feeling in his body was liget. And he finally had English words for it. ROSALDO: It's like being in high voltage. SPIEGEL: High voltage - those are the English words that most closely approximate the feeling of liget. ROSALDO: Like high voltage was flowing through my body. SPIEGEL: He says he came to feel that this emotion, liget, it was better for him than the typical way of American grieving. He says he had this new emotion, this new concept. And he was grateful for it. ROSALDO: Yeah. It was amazing relief. I sought it out. (Vocalizing). SPIEGEL: Alix Spiegel, NPR News. EAGLEOWL: (Vocalizing). Transcript provided by NPR, Copyright NPR.